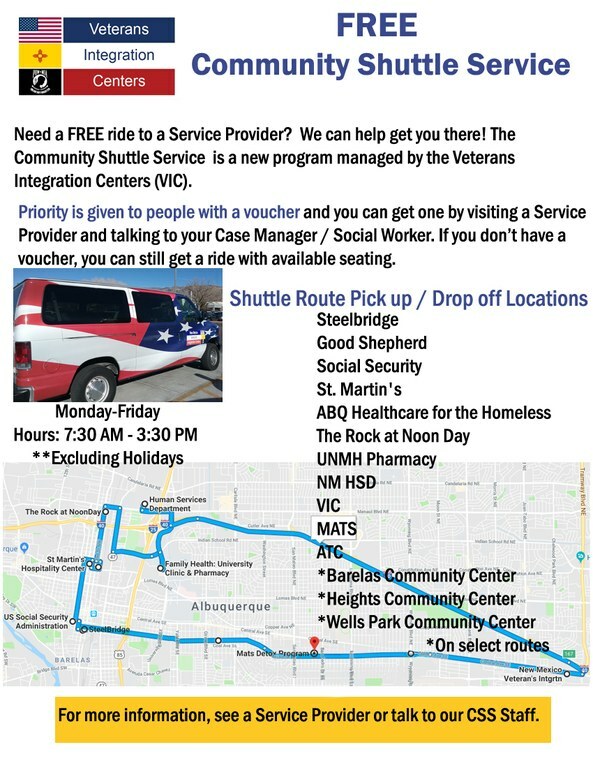 The Veterans Integration Centers (VIC) has begun a Community Service Shuttle program (“Shuttle”) through a grant with the City of Albuquerque, Department of Family and Community Services to provide a free shuttle service to those in the community who have difficulty accessing services, due to limitations with transportation. The Shuttle is intended to supplement existing public transportation. 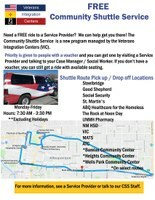 We are currently utilizing a 3 person and 1 wheelchair van to transport riders. It is anticipated we will have our 10 passenger bus (with wheelchair access) eventually. The VIC currently operates the Shuttle Monday through Friday from 7:00 a.m. to approximately 3:30 p.m. (excluding VIC holidays). A complete route takes approximately 90 minutes (with stops and loading of riders). We are currently able to complete two (2) routes in the morning and the afternoon. We will not be able to deviate from the route, but if someone needs a ride to a location near one of our stops, and space is available, we will be more than happy to drop them off at the nearest stop. Seating is based on a voucher system. If a case manager/social worker provides a rider with a voucher, they will have priority over a rider in the que. Any open seats will be given on a “first come, first served” basis.